MISSING: One pair mens' socks. 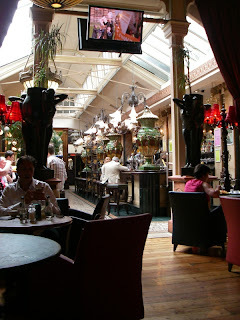 Knocked off at Café en Seine, Dawson Street, Dublin. If found, please return. Reward offered. 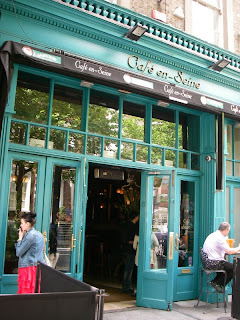 My other half took me to lunch at Café en Seine this weekend and all I have to say is WOW. Not only was the food amazing, but I think Hearst Castle is missing a couple rooms. The decoration in this restaurant was fantastic. 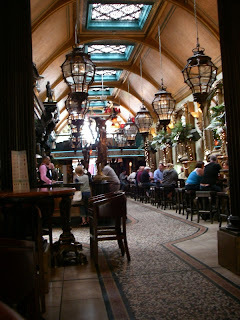 Sort of Empire, sort of Victorian, a dash of Art Nouveau and a healthy shake of Art Deco. In other words, Bohemian Stylish. 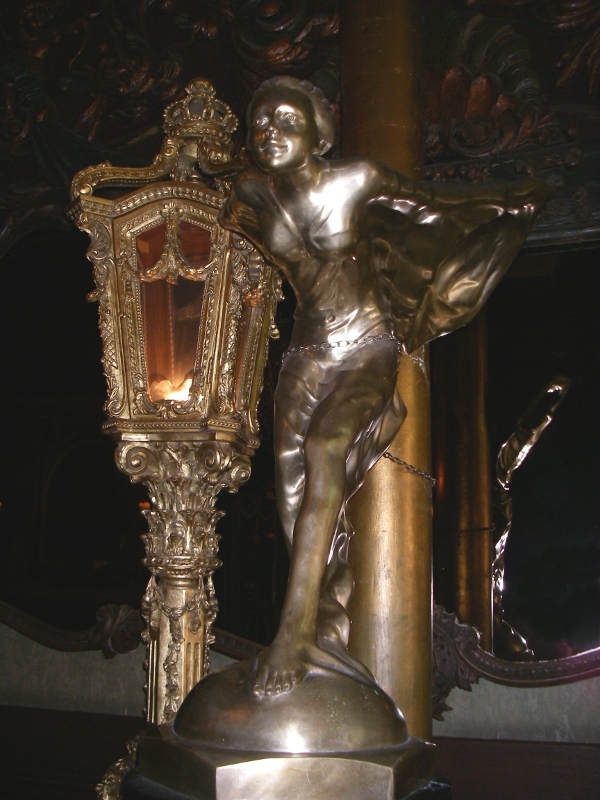 Upon walking in, one is greeted by what looks like the hood ornament from a Rolls Royce, standing next to a lamppost liberated from the Palace of Versailles. The floors are a fantastic free-form Art Nouveau mosaic. Everywhere you look there are massive ceramic urns, bronze statues of barely-clad ladies (rrrrow, baby!) and fancy pants chandeliers that look like they belong an a Parisian library. Somehow it all works, in a weird, William Randolph Hearst kind of way. 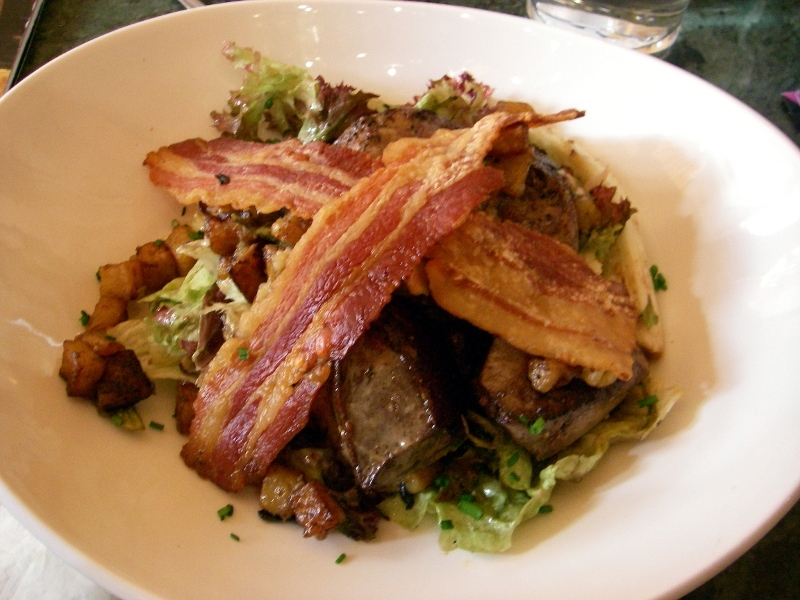 I ordered a fantastic warm salad with lambs' liver, bacon and a delicate hash of garlic potatoes. 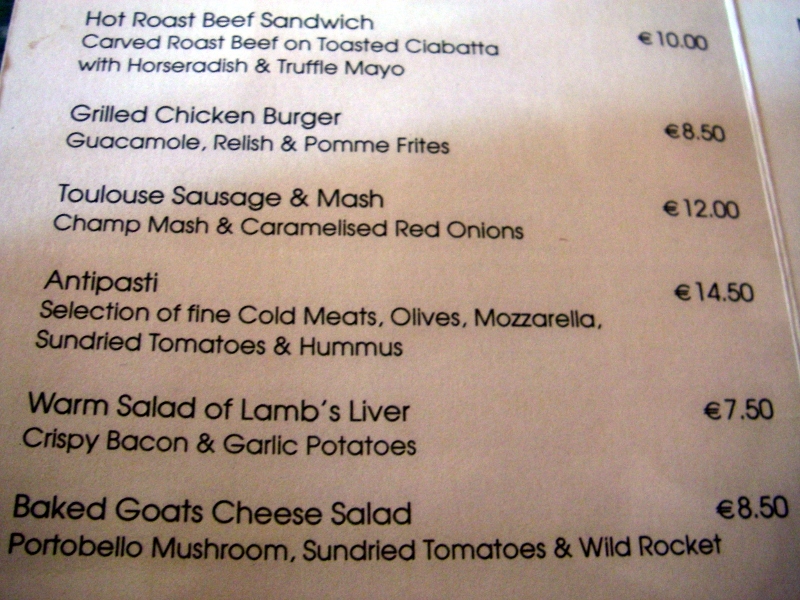 The lambs' liver was cooked perfectly and had just a hint of gamey flavor. My other half ordered a grilled chicken sandwich with a piquant pimento relish. It had just enough spark of heat without blowing away your tastebuds. When my family comes to visit, we are definitely bringing them here. This is like the Paris café version of Farralon in San Francisco. By the way, if anyone finds my socks, please let me know. What a fantastic find! Are those skylights, too? They are beautifully done. 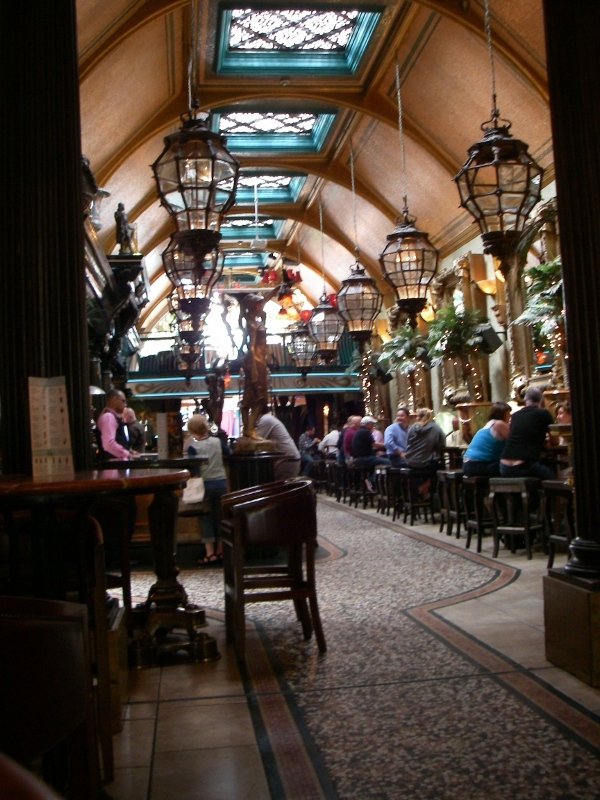 Have fun visiting often and sampling everything on the menu. Oh believe me, we will definitely be back. Yes, skylights in the third picture, with lighting fixtures stolen from the King of Spain underneath. Looks like a beautiful yummy place to eat! Never had any kind of liver before-- any recommendations where I could try it in The Bay? 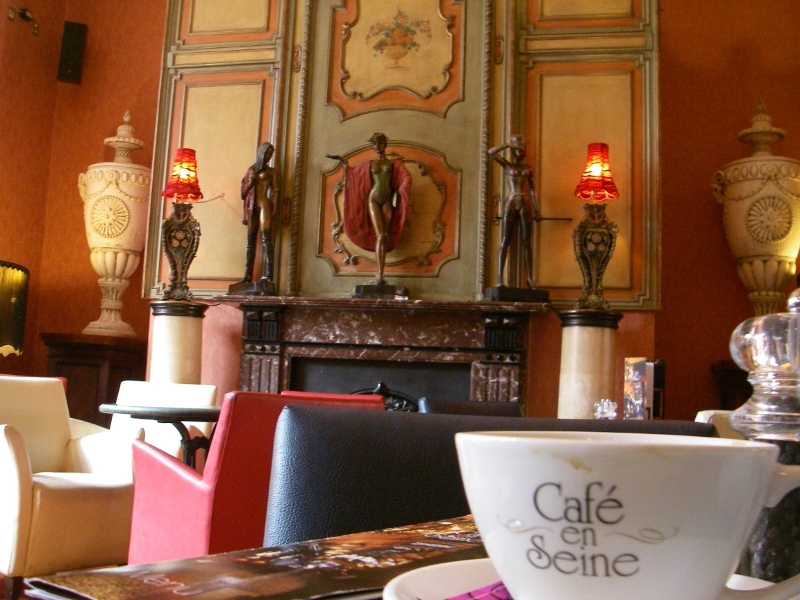 oh, this cafe´s interior design looks really nice :) and the prizes aren´t high for a place like that. Madeline: Thanks for the information on the Rolls Royce lady. The only thing I know about Rolls Royce is that they made the Merlin V-12 engine for the Supermarine Spitfire aircraft in WWII. They have them on display at the Palm Springs Air Museum--one of my favorite places. In answer to your question about liver, oooh, I have to say it is not for everyone. I happen to be a weirdo and I like offal. Liver, sweetbreads, heart, kidney, etc. I enjoy all that stuff. It is rare that I find it in a restaurant and to be honest, I usually cook it for myself at home. Oh my gosh, that dish looks like it could make me love liver! Interesting info on the Spirit of Ecstacy.